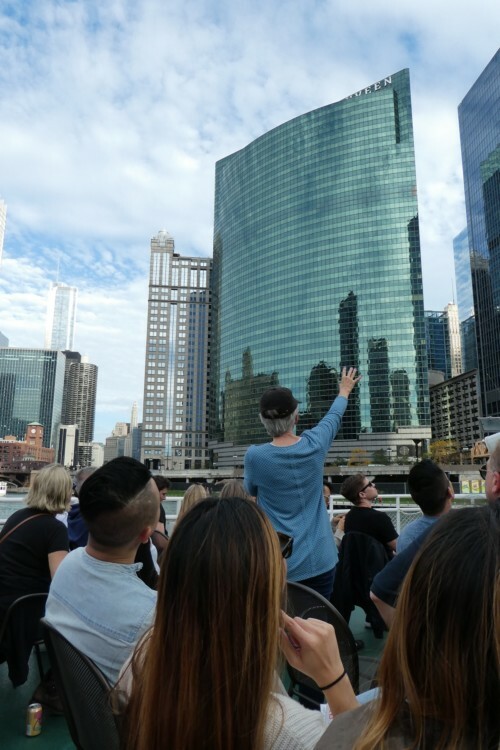 Courtesy of Chicago Architecture Foundation The Chicago Architecture Foundation offers 90 different tours of Chicago, including their popular boat tour along the Chicago River. Chicago has tours centered on food, gangsters, art, neighborhoods and more. One of the best tours? The Chicago Architectural Foundation’s boat tour. It’s not a boring lecture about architecture. It’s a beautiful slow boat ride through downtown Chicago, past the city’s iconic buildings. The tour teaches you about history, politics, business, art and, yes, architecture. Plus, you’ll find Instagram-worthy photo ops at every turn. 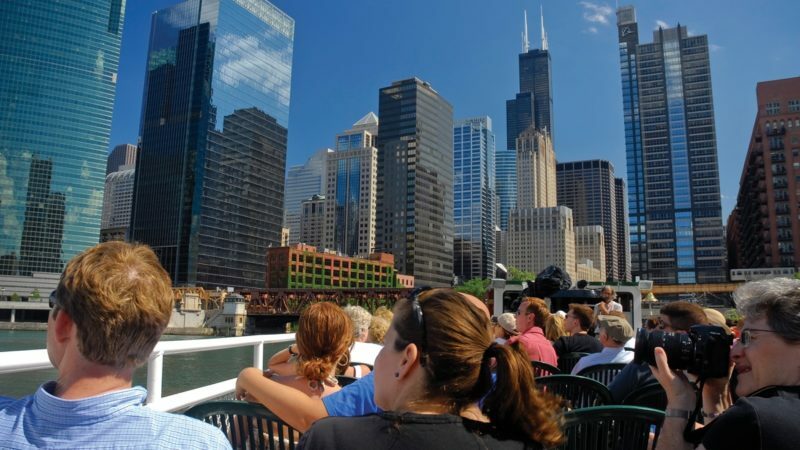 Of the 90 different tours it offers, the Chicago Architecture Foundation’s boat tours are the most popular. The Chicago Architecture Foundation offers 90 different tours in Chicago – ninety! – on foot, train, bus, boat or trolley. They cover everything from general skyline tours to niche interests, like Tiffany glass or the Bohemian National Cemetery. Whatever your interest, they have a tour for that. 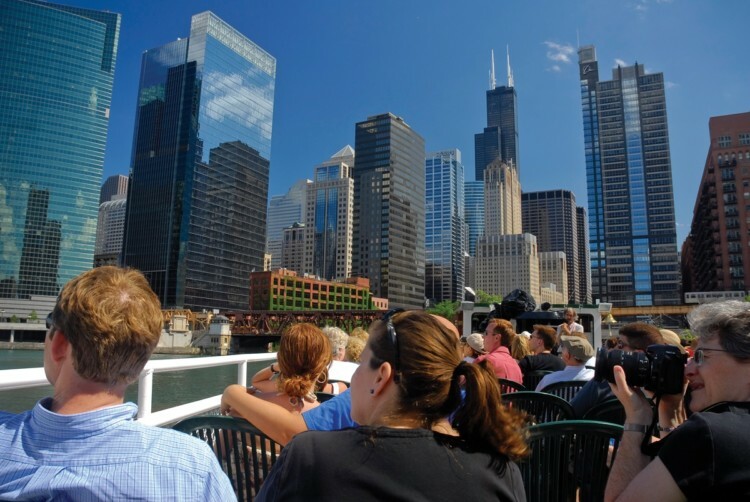 If weather permits, opt for the foundation’s boat tour along the Chicago River. It’s fantastic. Not only is it a pleasant boat ride through downtown, but you’ll learn a lot about the city and its history. 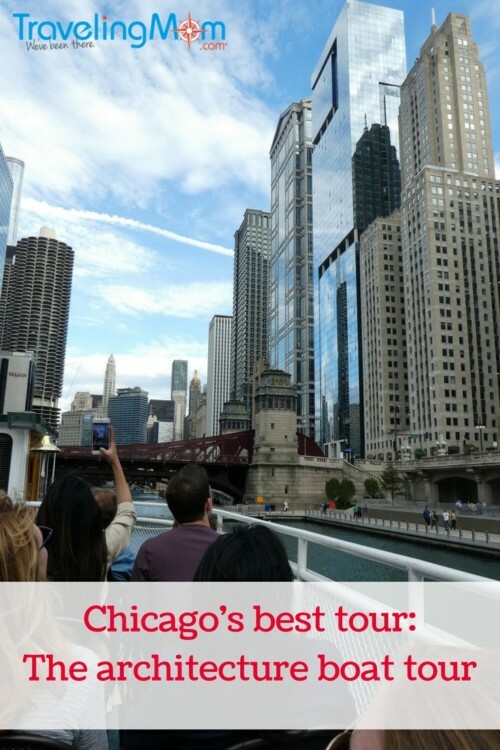 We recently went on their river cruise, aboard Chicago First Lady Cruises, and loved it. Our 90-minute tour slowly cruised past skyscrapers on the Chicago River (and along the crowds on the new Chicago Riverwalk). As lifelong Chicagoans, we’ve seen and walked past these buildings hundreds of times. But to really LOOK at them, and learn about them, gave us a whole new appreciation. We were in awe of just how beautiful they were, and how much world-class architecture this city has. Since the tours are seasonal, you can sit outside on the boat’s upper deck, or in the enclosed areas on cold or rainy days. Regardless of the weather, it’s important to buy tickets in advance. This is a popular tour that sells out quickly. Tickets are $46 for daytime cruises, and $49 for the 7:30 p.m. twilight cruises. I wouldn’t recommend this tour for young children, because I think they might be bored. It’s suitable for high school age kids and older. 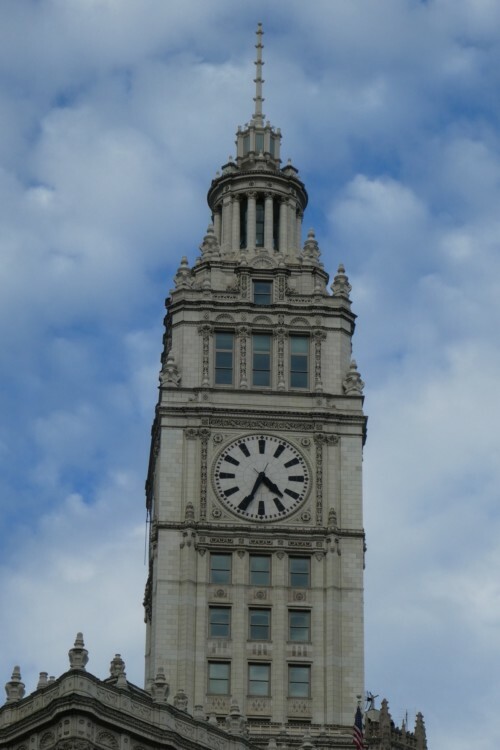 The Wrigley Building is along the Chicago Architecture Foundation’s boat tour. While I don’t know much about architecture or design, I still found the tour really interesting because the docent explained everything in a way that “regular people” would understand. Hearing the stories behind the buildings’ construction and design provided great insight into the city’s history. Our docent even described how engineers (somewhat miraculously) reversed the flow of the Chicago River to prevent sewage from flowing into Lake Michigan. That made it possible for the river to become the tourist attraction and development hot-spot that it is today. 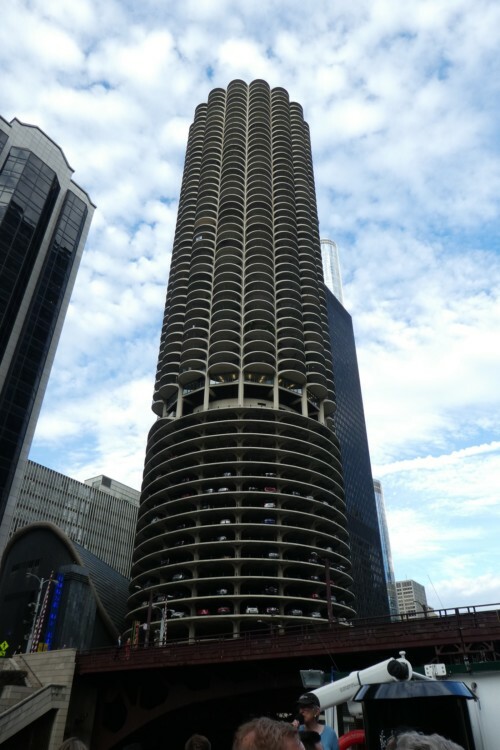 Marina Towers are among the sites along the Chicago Architecture Foundation river cruise. 2. It’s fun to ride a boat through downtown Chicago! The tour is done on a slow-moving boat on smooth water (so no need to worry about motion sickness). The river cruise cuts right through the heart of downtown, so there are skyscrapers on either side of you the entire ride. Even if you tune out the speaker (which you shouldn’t! ), it’s a lovely ride. It goes all the way from the edge of Lake Michigan, near Navy Pier, to the near west side of the city. TravelingMom Tip: The temperature can be significantly colder when you get near the lake. Bring a jacket, even if it’s a warm weather day. 3. You get a better view from the boat. From the sidewalk, you can’t really see Chicago’s skyscrapers in their entirety. From the river, you can. It makes a world of difference. Plus, you see them at different angles as you slowly float past. 4. You’ll hear lots of names of famous people and businesses. Donald Trump, Groupon, Apple, William Wrigley Jr., Ludwig Mies van der Rohe, Oprah Winfrey, IBM, and Betrand Goldberg are just a few of the recognizable names you’ll hear during the tour. For more ideas on things to do in downtown Chicago, check out my TravelingMom stories on what’s new at Navy Pier, and my favorite kid-friendly restaurants. Love this notion–thank you for the story. Reversing the flow of the river seems impossible. Wonder how many cities could comprise a list of metro boat tours? NYC for sure and I did an amazing on in St. Petersburg, Russia.